On a hot summer’s day, an icy beverage can be all you need to make the day that much better. Especially when it looks as delicious as this one does! The perfect fruity beverage to cool you down. Start with Valencia orange refresher juice to the first line, then add water until the second line. Fill the rest of the cup with ice and pour the contents of the cup into the blender and blend. Fill the cup with the slushy orange blended beverage leaving about 3mm of space on top. Optional: Add classic to taste for a sweeter less tart orange flavor and add an orange wedge for aesthetic presentation. 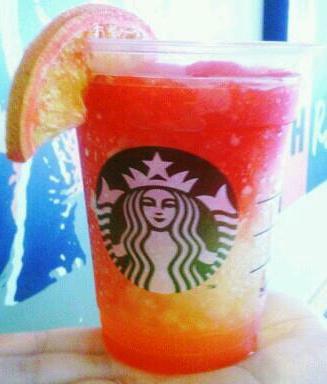 Big thanks to Barista, Jolene P. of Uptown Whittier for sharing this wonderful looking recipe with us. If you have a recipe you’d like to share, send it in to starbuckssecretmenu [at] gmail.com and we’ll add it to the list!